More Koreans took up smoking last year despite a price hike and other efforts to promote public health. According to data released by the Ministry of Health and Welfare on Monday, the smoking rate among men rose to 40.7 percent in 2016, up 1.3 percentage points from 2015. The figure for women also grew from 5.5 percent to 6.4 percent. In 2015, when cigarette prices were hiked from W2,500 to W4,000 a pack, the rate of male smokers fell to 39.4 percent from 43.1 percent in 2014. The ministry said the rebound was probably temporary as cigarette sales have fallen this year. In the first eight months of the year, they stood at 2.32 billion packs, down 4.4 percent on-year. "We expect the smoking rate will drop again this year as the government took measures like putting graphic health warnings on cigarettes last December," a ministry official said. 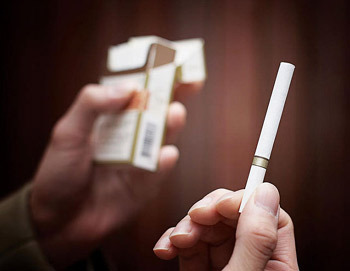 The ministry claimed the government's anti-smoking efforts have proved effective in the long term. The price hike, in particular, helped discourage teenagers from smoking. In a recent online poll of teenagers, the smoking rate among boys plunged from 14 percent in 2014 to 9.5 percent this year. "The government should expand its anti-smoking policy by banning display and advertising of cigarettes in stores and enlarging the graphic images on cigarette packs to further reduce smoking rates," said anti-smoking activist Seo Hong-kwan.